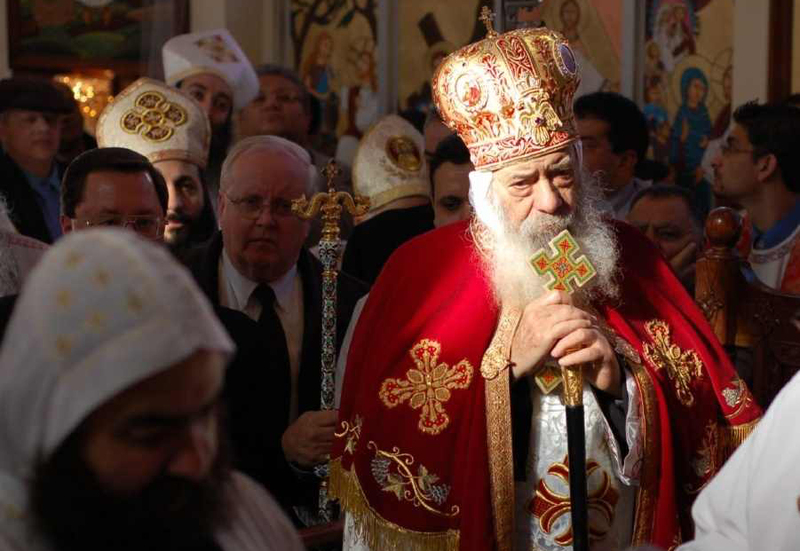 Pope Shenouda III, born as Nazir Ga’yid, passed away and left his faithful on Saturday 17th 2012. I have observed the three day mourning period in respect with Church custom and refrained from posting about this. Now that it is over I intend to go back to the topic which interests me greatly and is my thesis project. Like many people who were distraught with the Church in the past and its politics I had numerously criticized the Church. I had criticized its old leadership and numerously said what many onlookers knew: the Pope did not have much time left and many grew weary of his inability to rule due to his age. I could greatly relate to what Joseph Fahim wrote, a person whose father was the Pope’s personal lawyer and how he grappled with the very sensitive subject. For many onlookers people do not understand that there is no stronger bond between the Pope and his faithful. It is this very bond that disturbs many people who see Christians in Egypt as not being integrated in society. Some equate the death of the Pope and his people with Egyptian’s grief when Nasser died. This profoundly shocked me, for a community whose “laity was supposedly more religious than its clergy” as Edward Wakin remarked in his book A Lonely Minority. People should understand that old age and death are natural. Some Pope’s service lasted only 6 years like Pope Cyril IV. People must look past that and look towards their own Church, its youth and ask themselves the fundamental question of are Copts a minority? Better yet, do they want to be a minority? It is no more embarrassing but worthy to note that it was Mohamed Ali who raised the jizya tax off of Copts and fully integrated them into society. He allowed them to serve in the army much to the Copts’ disapproval and protest. This is what I mean as both embarrassing and at the same time not only about Copts own conditions but how they perceive themselves. His political aid Mualim Ghali was a Copt. It is time to look past how many Copts there are in Parliament, how many Christian ministers there are and how many are elected. No one can deny the outright persecution that Copts have suffered under the Abbasiyd and Fatamid era. However it is time for closure and time to realize that there are common causes universal to all Egyptians. The Maspero youth movement has demonstrated that. So too has the Priest who apologized for shaking hands with the murder, head of Military Police Hamdy Badeen. Change is happening inside the Church; albeit at a slow pace. The incoming Patriarch knows this and must instead revisit fundamentally old questions. Will he allow the majlis al mili (laymen council) to be independent? Will the secular elite Christians be allowed back inside the Church to serve a role and fully integrate in Egyptian society? Will Christians hide in their enclave and their community? To say that any of these problems are the result of Pope Shenouda III or to symbolize him for that would be historically inaccurate. No Pope has fundamentally altered this since Pope Cyril IV since before the time of King Farouk. Criticism of the Pope as a symbol of tyranny is born out of a discourse that perpetuates Copts as a continuation of an imperial conspiracy and secludes them. For the first time in Egypt we have the luxury of having a learning curve. It will not happen overnight that we realize this discourse or even yet understand its objectives. For years this discourse has been propagated and any debate on minority rights in Egypt was brought with accusations of Zionist conspiracies and plots to split Egypt. “At the end of this intimate rendezvous with the Copts, a concluding moral note is unavoidable. The obligation to oppose tyranny stands even when the tyranny is elusive and unannounced, even unintended. It begins with labeling injustice long before shop windows are smashed, icons broken, and families torn apart”. It’s not only about where do coptics see themselves ,i’m muslium on goverment data only but in reality christian for sure my parents don’t know about that ,many ex-muslims are suffering from such treatment and no one from the media bother to talk about our rights as if we aren’t egyption we really seek help and most of the egypton are ex-muslims so muslims don’t think of your selves number , the matter is if they know that one of the muslim left islam they would kill them so how could we do so..